The era / area that I am interested in is pre 1970 Alexandra Parade, Glenfield and James Orr Streets. 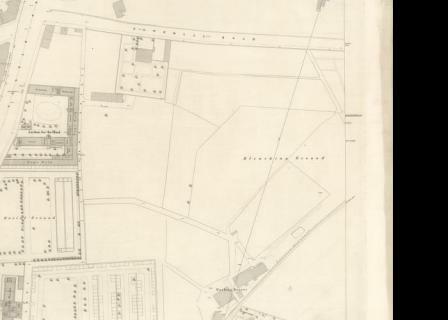 In particular, the section of Alexandra Parade that was bounded by Castle Street and Wishart Street and is now buried under the New Royal Infimary site. I have marked the area on map. I was wondering if anyone has or knows of a source of auld images for this particular area. I have been through The Mitchell, SCRAN, Glasgow Story with a fine tooth comb. Sadly, there are relatively few images of the area / era that I am hoping to dig out. So hopefully someone may know of another repository or even have images of this area themselves! Dug up a map of what area was like 1857ish. Was called Townmill Road then. 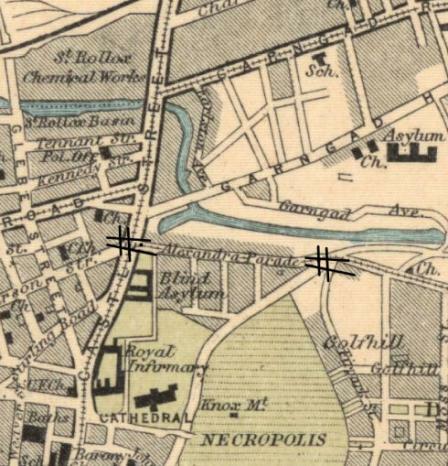 Wishart Street had a different alignment and it looks like the Auld Sockie, Molindinar Burn was not covered over and there was a bleaching ground where Glenfield and James Orr Streets would have been. Very interesting what auld maps can tell you. Here is the old 1857 map overlaid with the current road system. You can see what a mess it made of Townhead, remembering that at that time, some of Townhead was not even built!